Crocheting baby blankets are something special to me. The fact that it is handmade trumps store bought every time. I enjoy spending time thinking about the pattern and creating it specifically for the new baby. It’s a tradition that many crocheters like to keep. 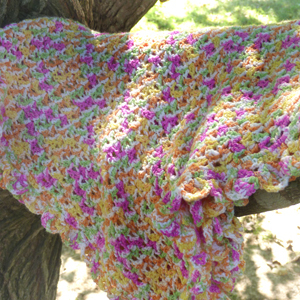 This blanket has a simple but beautiful stitch pattern and a frilly border that is just the right touch. I chose to work it with Bernat Baby Coordinates’ Posy Patch, but any baby yarn, variegated or solid, will work just as well. This entry was posted on Thursday, September 25th, 2014 at 12:00 AM by Amy	and is filed under Best Crochet Patterns. You can follow any responses to this entry through the RSS 2.0 feed. You can skip to the end and leave a response. Pinging is currently not allowed.